Israeli artillery shelling hit the United nations centre for humanitarian assistance in Gaza City today, setting the building ablaze. UN Secretary General Ban Ki-moon immediately protested. Then Israel’s prime minister said the Israeli military fired artillery shells at a U.N. compound in Gaza after militants opened fire from the location. Olmert was quoted by the Associated Press. “[Israeli] Defense Minister Barak said to me it was a grave mistake and he took it very seriously,” the UN Ban Ki-moon said at a news conference in Tel Aviv with Israeli Foreign Minister Tzipi Livni. Regez was quoted by CNN. The military push may be aimed at stepping up pressure on Hamas as cease-fire talks in Egypt entered a pivotal stage. The U.N. chief says he has expressed “strong protest and outrage” to Israel over the shelling of a United Nations compound in Gaza City. Israeli shells damaged the international organization’s headquarters in Gaza City, according to witnesses and U.N. officials. U.N. spokesman Chris Gunness says at least three people were wounded. 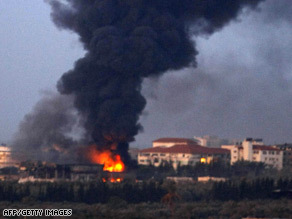 Israel launched an offensive against Hamas in Gaza on Dec. 27. It wasn’t clear whether this would be a brief foray or signal a new phase in Israel’s devastating offensive against Gaza’s Islamic Hamas rulers. You are currently browsing the archives for the Bark category.